In the Spring of 1918 the labor movement was well underway in the United States and most manufacturers had resigned to a shorter, 54-hour work week. 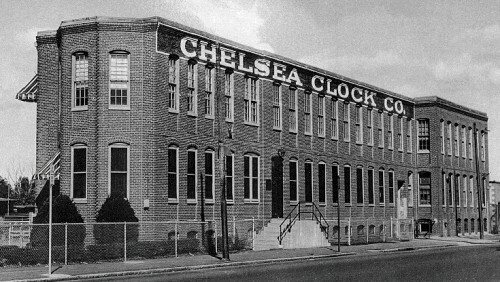 Although Chelsea Clock had been enjoying healthy profits for nearly a decade and was operating on a 54-hour work week, the hourly wage within the company was less than that in most manufacturing facilities nationwide. Discontent and unrest was bubbling on the inside. On March 1, 1918, just shy of 200 employees marched out of the factory, demanding both a reduction of the 54-hour work week and an increase in wages for overtime. According to Chelsea scholars Andrew and David Demeter, these demands were presented above a “round robin” — a circle in which workers scrawled their signatures as an act of solidarity (it was hypothesized that management would be unable to detect or assume any movement leaders this way). 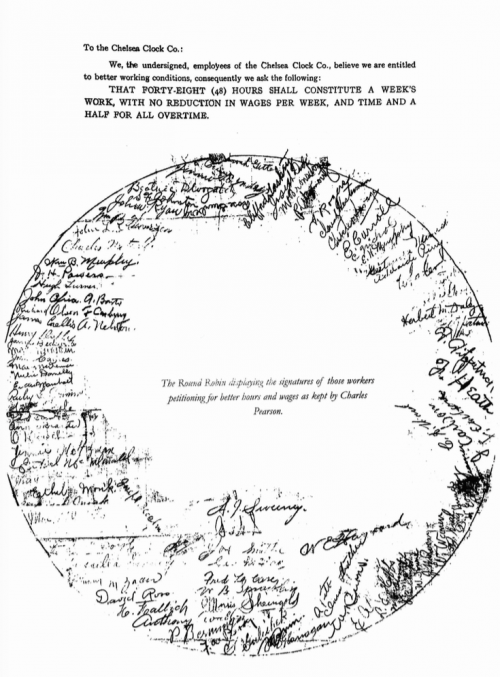 The strike — the first and only in Chelsea Clock history — garnered the attention of the Massachusetts State Board of Conciliation and Arbitration. Two days later, on March 3rd, Chelsea Clock owner Charles Pearson wrote a five-page letter to the Chairman of that board, in which he called the strikers’ demands unreasonable and unfair, and said agreeing to them would “make it exceedingly difficult to run our factory and make a profit.” Pearson went as far as to insist that 10 of his competitors, including the well-known Seth Thomas Clock Company, would first have to agree to run their own factories on the basis of an eight-hour work week in order for Chelsea Clock to do the same. While Pearson was firm that he was unwilling to budge on the length of the work week lest his competitors did so as well, he did eventually concede to an increase in overtime pay from 1.25 to 1.5, and a 5 percent pay raise for female employees (a wage increase that affected less than 25 percent of his work force payroll) … and life at the factory quickly went back to business as usual. Your grandfather was an excellent clock builder and a clock collector. Did your grandfather work for chelsea?